The production of 1934’s MAUVAISE GRAINE provided a decent training ground for fledgling filmmaker Billy Wilder to hone his directorial skills, but dramatic events on both the world and personal stages would preclude him from making his next film for nearly ten years. Sensing that the writing was on the wall when Adolf Hitler’s Nazi regime swept into power, Wilder fled Paris for the sunnier climes of Los Angeles. He soon carved out a successful niche for himself as a Hollywood screenwriter, collaborating on many scripts with his new writing partner, Charles Brackett. During this time, he also married Judith Coppicus and fathered two children, Victoria and Vincent (who unfortunately died shortly thereafter). By the time he felt ready to direct his second feature film, Wilder’s life had changed quite drastically. When we think of somebody making their “Hollywood debut” film, we tend to think of a young, hungry director without a ton of experience. At 36 years old, Wilder was certainly young, but he already had three Oscar nominations for writing under his belt when he convinced producer Arthur Hornblow Jr to let him back behind the camera. In order to guarantee himself a career as a successful Hollywood director, Wilder decided to adapt the most commercial story he could find, eventually settling on a play called “Connie Goes Home” by Edward Childs Carpenter. Wilder and Brackett took Carpenter’s source material and turned it into THE MAJOR AND THE MINOR (1942), a lighthearted romantic comedy of the sort that Wilder would later turn into his calling card. The film is set in 1941, presenting a more-innocent America that’s yet to be scarred by Pearl Harbor and the ravages of World War II, but can still see the dark clouds gathering on the horizon. Susan Applegate (Ginger Rogers) is a New York working girl who makes a meager living giving scalp massages to lecherous old rich men. After one unwanted advance too many, Susan quits on the spot and heads to Grand Central Station to catch a one-way train back to Iowa. She’s squirrelled away $27 in emergency cash for this very situation, but when she arrives to buy a ticket, she finds she hasn’t accounted for inflation. Unable to afford a full-price ticket, she poses as a twelve-year old girl for the half-fare. Once on the train, she comes under the suspicions of a pair of overzealous ticket takers and hides out in the cabin of a stranger named Major Kirby (Ray Milland). Kirby is fooled by her charade, but he also takes it upon himself to act as the girl’s interim guardian, insisting she accompany him to his destination while they try to contact her mother. Susan unwittingly finds herself at Kirby’s military base and under siege from the affections of a horde of prepubescent cadets and the side-eyed scrutiny of Kirby’s fiancee, all while falling for the dashing young Major herself. THE MAJOR AND THE MINOR’s cast is comprised of iconic Golden-era Hollywood faces. Female lead Ginger Rogers was instrumental in Wilder securing the job of director, having used her newfound clout after winning the Best Actress Oscar for 1940’s KITTY FOYLE to push the untested filmmaker into consideration. As the spunky, street-smart city girl Susan Applegate, Rogers brilliantly maneuvers a complex comedic performance that requires her to swing between a 12 year-old child and a full-grown woman at the drop of a hat. Co-star Ray Milland more than holds his own against Rogers’ boundless energy, playing the character of Major Kirby as a decent and honorable gentleman with a bum eye that leaves him rather gullible to Susan’s fraud. His inability to correctly gauge her real age may not be the most believable aspect of Milland’s character, but his commitment to the performance helps to sell the zany nature of the plot. If anything, the anecdote about how Milland came to be cast is more interesting than the performance itself– Wilder reportedly offered Milland the role by shouting the offer over to him in his car while the two were stopped at a traffic light. THE MAJOR AND THE MINOR’s visual presentation represents a huge leap in quality from the scrappy, lo-fi look of MAUVAISE GRAINE. The sizable budget afforded by studio backing and the highly-controlled nature of soundstage shooting allows Wilder to pursue the glossy, polished aesthetic that was typical of Hollywood pictures of the day. Shot in 35mm black-and-white in the then-industry standard 1.37:1 square aspect ratio, THE MAJOR AND THE MINOR sees Wilder collaborate with cinematographer Leo Tover in the creation of slick lighting setups and polished camerawork that favors static set-ups over flashy moves. Wilder mostly tends to shoot THE MAJOR AND THE MINOR in 2-shot masters to best capture the story’s physical comedy, like one would record a live stage play. He supplements this style with an economical and minimal attitude towards coverage, employing subtle dolly work and strategic close-ups only where the story demands it. Wilder learned this approach from his editor Doane Harrison, who coached the young director on his craft throughout production. Harrison instilled in Wilder the usefulness of “in-camera editing”– the practice of pre-cutting the film in your head and shooting ONLY what you know you will need (as a way to keep outside voices from meddling too much with your vision). Most productions shoot a lot of coverage so as to give themselves several options in the cutting room, but the technique of in-camera editing leaves the editor with only one option– the director’s vision. Due to Wilder’s success with this technique in THE MAJOR AND THE MINOR, he’d go on to adopt it in later works and develop a reputation as an extremely economic filmmaker. Like MAUVAISE GRAINE before it, THE MAJOR AND THE MINOR is surprisingly risque considering the pearl-clutching times in which it was made, skirting around the censors by painting decidedly-mature issues like adultery and fraud in the color of family-friendly slapstick comedy. The film is an early instance of some of Wilder’s most high-profile hallmarks as a director: tight plotting, and the presentation of complex human flaws like gullibility and willful ignorance in the context of a comedy of manners. One of the film’s key dichotomies– that of the low-class hero contending with the high-class snobbery of ignorant and out-of-touch elites– would go on to serve as a recurring thematic exploration in Wilder’s later work. Bolstered by composer Robert Emmett Dolan’s brassy, big-band score, THE MAJOR AND THE MINOR thrilled audiences and critics alike with its bouncy effervescence upon its release in 1942. The success of the film elevated Wilder’s profile as a growing voice in cinema, opening the doors to more directorial work within the studio system and providing a pathway towards his first major work, 1944’s DOUBLE INDEMNITY. While THE MAJOR AND THE MINOR is a lesser-known work within Wilder’s extensive filmography, the ensuing decades have seen little (if any) erosion of its original charm and wit. THE MAJOR AND THE MINOR’s artistic legacy to the medium and Wilder’s career may be… well, minor, but it does serve to reinforce Wilder’s stature to modern audiences as a first-class director of timeless, endlessly charming Hollywood entertainment. 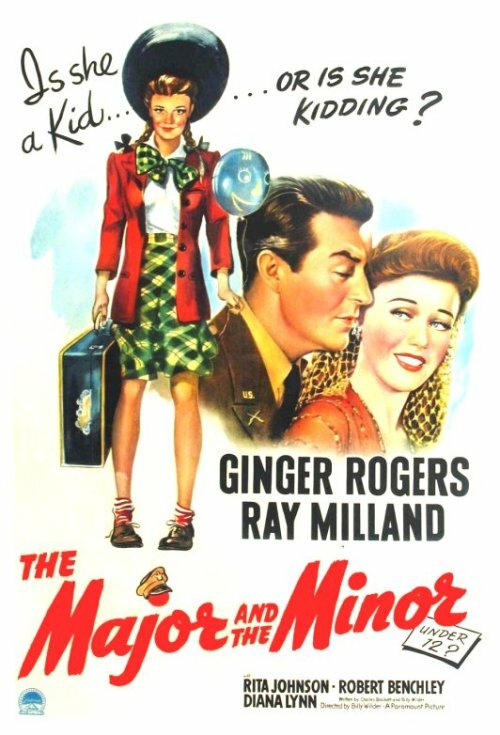 THE MAJOR AND THE MINOR is currently available on standard definition DVD via Universal.